I wanted to end off this week's homemade theme - head here to share yours - with the somewhat sad sight of shattered eggshells. 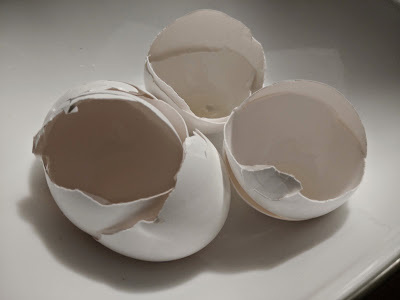 In many respects, the egg is one of those perfect little structures of nature and biology, a self-contained engineering masterpiece that even mighty, tech-forward humans couldn't have invented. It's somewhat humbling, then, to come across an egg and think about how it came to be, and how little we truly understand about its origins and evolution. I get weird like this every once in a while. Okay, perhaps more often than that. Thanks for indulging me. Your turn: What other seemingly routine everyday objects make you stop and wonder?